Solbar at Solage Resort & Spa, 755 Silverado Trail, Calistoga. 866.942.7442. GO WEST Chef Gustavo Rios' career started in faraway Virginia. To say chef Gustavo Rios knows his way around the culinary scene in Calistoga is a safe bet. Upon his arrival over a decade ago, he had already honed experience at some of the best restaurants on the east and west coasts. Known as Gus (pronounced like "goose") to his close friends and family, Rios began his career at River's Inn Restaurant in Virginia, where he managed a small tapas-style kitchen. From there he worked in a kitchen at the foothills of the Blue Ridge Mountains and at the Inn at the Little Washington, a five-star restaurant in Virginia. In 2002, Rios decided to move to the West Coast to experience the rising culinary scene of California. He worked at the Peninsula Beverly Hills Hotel in Los Angeles as chef's assistant before joining the Thomas Keller team at Michelin star–rated Bouchon Bistro in Yountville in 2005, where he served as chef de partie. 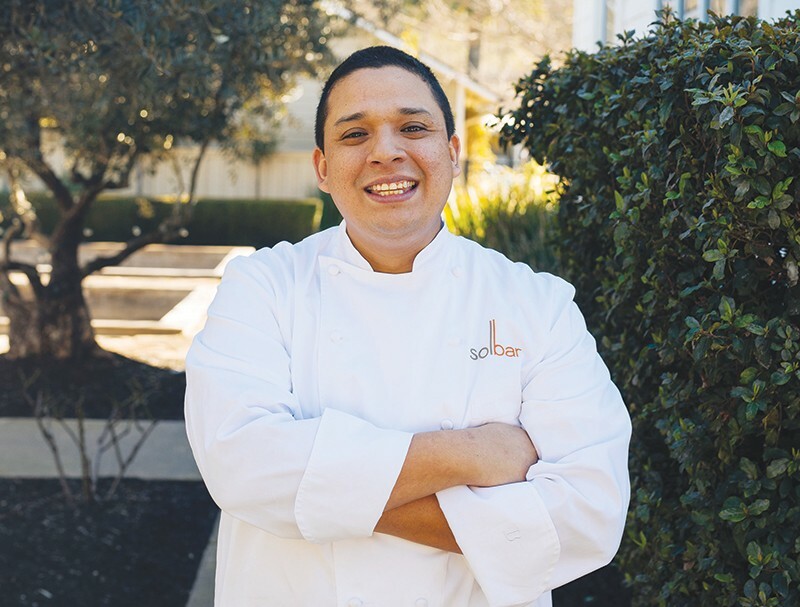 A few years later, Rios left Bouchon Bistro for mentoring from seven-time Michelin star recipient Brandon Sharp at Solbar, the restaurant at Solage, an Auberge Resort in Calistoga. During his seven years at Solbar, Rios played an integral team role in achieving those Michelin star awards. Rios was recognized in 2013 for his dedication and passion as Manager of the Year, and climbed from his role as chef de partie to executive sous chef and chef de cuisine before an irresistible opportunity surfaced in 2015: Rios joined forces with Sharp to create the concept for a Calistoga-based French bistro. Which would become Evangeline. When Evangeline opened its doors in 2015, Rios took on the task as head of culinary operations and executive chef. While Sharp soon returned to his hometown in North Carolina, Rios shined with creativity; some say he started a "to-go" fried chicken cult following on Thursdays during the summertime Calistoga Concerts in the Park. It's safe to say Rios has been an integral part of Evangeline's success and popularity, and that he has elevated the culinary scene in Calistoga and the Napa Valley. This year, Rios returned to Solbar as executive chef. He plans to continue to draw on his deep, long-standing relationships with top Napa Valley farmers and winemakers to take the culinary operations at this hot spot resort in Calistoga up a notch, perhaps securing a Michelin star again. Most notable about Rios is his commitment to using whatever is in season. "We are extremely spoiled with what is available right in our backyard," he says. "I cook what I cook because of people like Barni from Forni Brown or Kory from Wineforest [mushrooms], or Tim from K&J Orchards." At Solbar, the first order of business for Rios is to re-create comfort with ever-changing menus featuring seasonal, soulful dishes that celebrate bold flavors and incorporate his Latin background, his innovative methods and his experience in European cooking. Signature dishes such as Solbar's fish tacos will remain, and prix fixe tasting menus will be added to showcase some of the top local and world-renowned wineries such as Chateau Montelena, Eisele Vineyard and Knights Bridge. Chef Rios has no qualms about his return. "It's home for me, and when this opportunity presented itself, it was an easy decision to return and reestablish the restaurant as one of the very best."